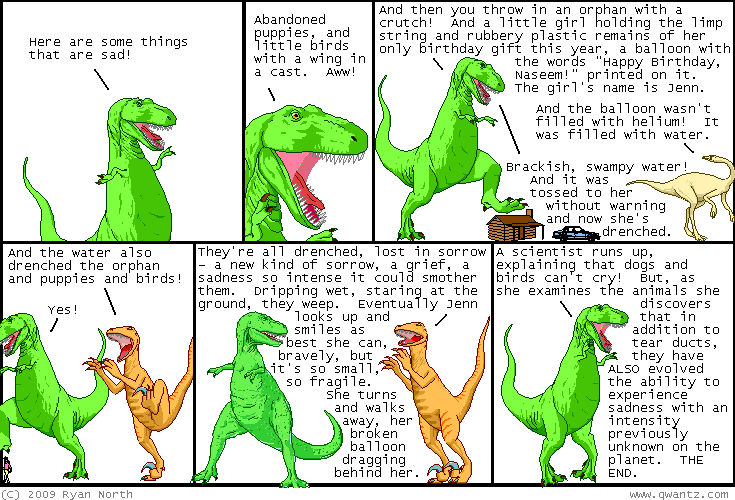 Dinosaur Comics - February 3rd, 2009 - awesome fun times! –I order a drink for the angriest-looking lady in the room! February 3rd, 2009: Some of my shirts are being discontinued to make room for as-yet-imaginary new designs! If either of the two garment illustration below strike your fancy, you should buy them now, because it is likely your last chance in the history of the Universe to do so!! I am really sad to see the moon one go because it is a movement I can get behind. One year ago today: guys, my med student friend is now my doctor friend! let's hear it for her success and her knowledge about what, in particular, makes bodies gross!